Silk Eye Masks - luxurious 100% natural and hypoallergenic mulberry silk, with a top quality super soft 25 momme mulberry silk outer. 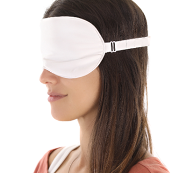 The silk eye masks you'll see here are filled with luxurious 100% natural and hypoallergenic mulberry silk, with a top quality super soft 22 momme mulberry silk outer. Because both the inner and outer are 100% natural mulberry silk, and of such high quality as not to require any chemical treatment or processing, the silk remains rich in the natural amino acids and the protein sericin that are so good for our skin, keeping our skin young and helping to reduce wrinkles. Properties in mulberry silk also promote relaxation in the central nervous system. Great as a stress reliever, getting to sleep, relaxation, and meditation. Elastic strap adjusts for comfort. All orders are covered by a 14 days full money-back guarantee. Return for any reason, we'll even pay the return delivery fee. We're sure you'll love your mulberry silk-filled eye mask! Mulberry silk-filled bedding and related products are our specialism, we promise you won't be disappointed. These are the very best of the best of mulberry silk eye masks. All products are dispatched from within the UK on same or next day of ordering and is OEKO-TEX Standard 100 certified. Worldwide delivery options are available.